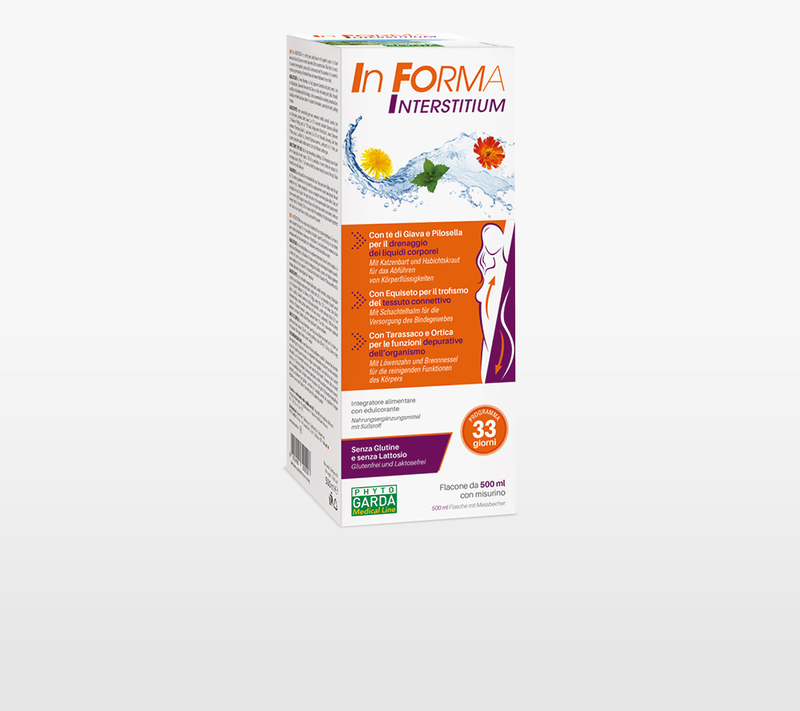 In Forma Interstitium is a food supplement formulated with plant extracts. Java tea (Orthosiphon) and Mouse-Ear Hawkweed can help with draining body fluids. Horsetail, in addition to stimulating body fluid drainage, is also recommended for nourishing connective tissue. Dandelion and Nettle have been added to complete the formulation, supporting the body’s purifying functions. water, concentrated grape juice, sweeteners: sorbitol, mannitol, sucralose; Stinging nettle (Urtica dioica L., leaves), Java tea (Orthosiphon stamineus Benth, leaves) d.e. 0.1% sinensetin, Dandelion (Taraxacum officinale (L.) Weber ex F.H.Wigg, root) d.e. * 10% inulin, Mouseear hawkweed (Hieracium pilosella L., aerial parts) d.e. 0.5% tot. flavonoids, flavouring, Horsetail (Equisetum arvense L., aerial parts) d.e. 1% silica, preservative: potassium sorbate; acidity corrector: citric acid; thickener: xanthan gum. take In Forma Interstitium by diluting a 15ml measuring scoop of product in a large glass of water (approx. 150 ml) or, preferably, it is best to dilute the contents of a measuring scoop in 500 ml – 1 l of water and drink the mixture during the course of the day. 500 ml bottle with measuring spoon.